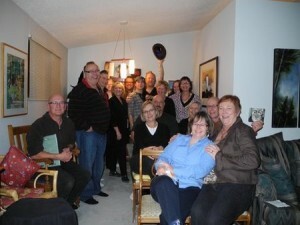 Home › Host › What Is A House Concert? House concerts are just what they sound like, a complete concert performance with professional musicians located directly in the biggest room of your house. Most house concerts operate without a sound system. The shows are presented as solo, duo or trio performances. Occasionally an artist will bring a small amp for their keyboard or as voice reinforcement, but for the most part, these are entirely acoustic shows. A successful house concert depends on the enthusiasm and efforts of the host to introduce world class artists to their friends and family. A successful house concert host is more often than not a gregarious fun-loving person who is devoted to their community and loves music. 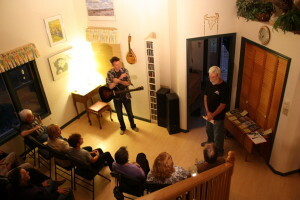 House concert hosts promote the shows in their community through their personal contacts, by phone, email, and most importantly, word of mouth. The excellence of Home Routes performances by the best Canadian and international artists, assures a loyal and growing audience. Some concert rooms hold 25 people and some hold 60. Many hosts sell season tickets in advance. House concerts are not free events. These shows are delivered by professional touring artists who have spent their lifetime learning their trade. House concerts have a triple function. They support artists’ ability to make a living, they make music accessible on a grass roots level, and lastly, they connect people; a social engine that builds community. Home Routes is a kaleidoscope of experience for hosts, performers and audiences of different cultural backgrounds, engaging with each other in this musical and personal adventure.